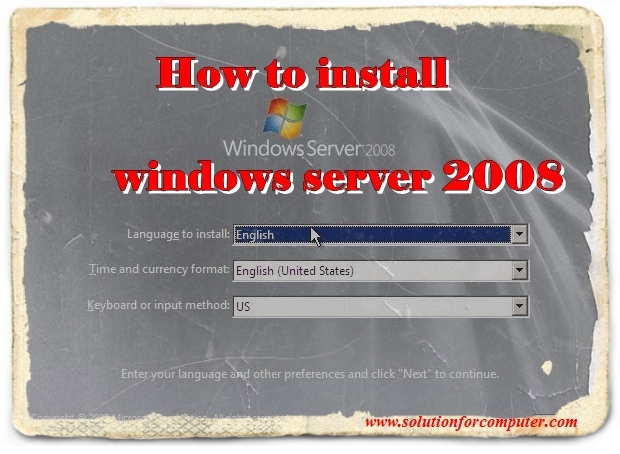 How to install windows server 2008. Processor : minimum 1 GHz processor or 2 GHz processor recommend requirement for installing server 2008 installation. RAM : 2 GB ram is recommended for installing Windows server 2008 installation. Hard Disk Drive : For installing Windows server 2008 40 gb free hard disk space is recommended. Restart your computer and go to BIOS. Select first boot device dvd writer then then save and restart your computer and press any key boot from dvd. Select languages for installation, select your country , select your keyboard or input method and press next button to install server 2008. Now click on no button select the edition of windows server 2008 that you want to install.after select the edition of windows server 2008 click on I have selected the edition of windows that I purchased option and click on next button. Then read license term and conditions and select I accept the term and conditions option and click on next button. After that option show which type of installation do you want? If you upgrade your windows click on upgrade button otherwise click on custom (advance) option to install the windows server 2008 . After selecting custom option select a drive where you want to install windows server 2008 and click on next button to starting installation of windows server 2008.
before completing installation of windows server 2008 computer is restart one time during installation process. After the windows server 2008 is complete a massage is show on your screen -user most change the password before the first logon to computer. Press ok button. Now your server 2008 is now complete.